Important Note: The Reference Number printed on CAT Admit Card would be used only for identifying the Exam Lab / Console in the Test Center on the Exam Day. The primary reference identity of the Candidate would be the CAT Registration Number. Please also note that CAT Admit Card issued by IIM Kozhikode is provisional. Your candidature is subject to having paid the applicable CAT Test Fees and fulfilled the eligibility criteria of Academic qualification, Category, PwD status etc., as has been mentioned in the Application submitted. These details would be verified in the subsequent stages of the Selection process. 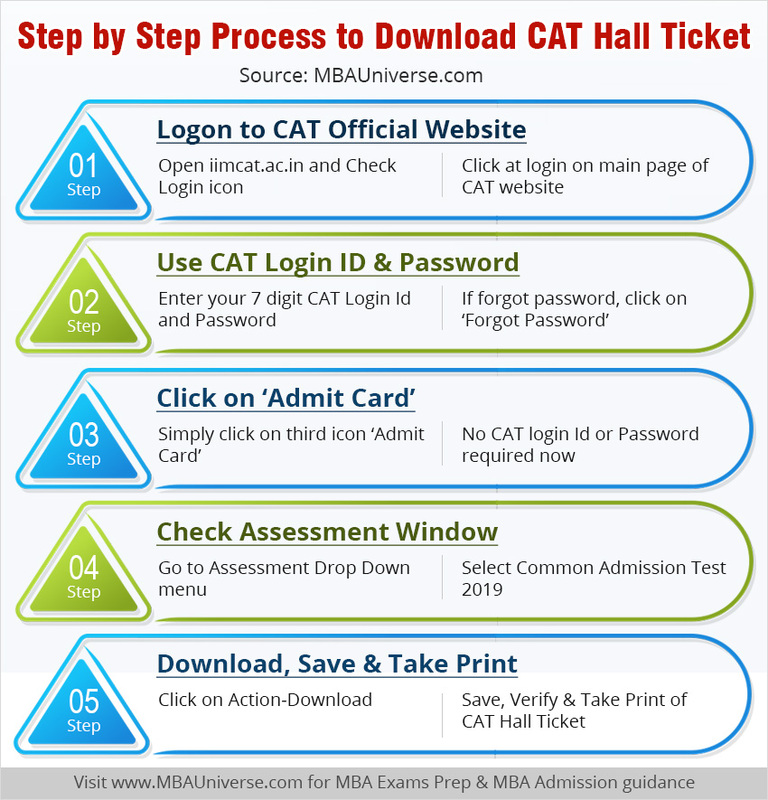 You can view, download and take CAT admit card print out in 5 simple steps from official CAT website. No hardcopy of the CAT Hall ticket 2019 will be sent to you. Download process is simple and may not have any technical glitches once the admit card is uploaded. It is advisable to download and take CAT admit card print out at the earliest as it will be helpful to verify your details and get them corrected from CAT centre in case of any anomaly. Only the candidates whose CAT form has been submitted successfully will be able to view and download CAT Admit Card 2019. 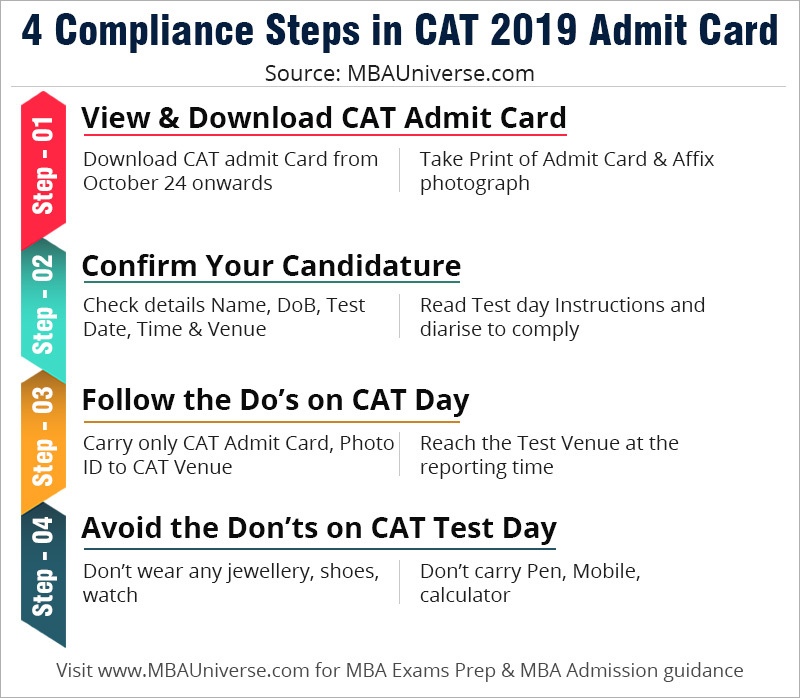 CAT 2019 Admit card is to have the emergency contact number. This is the candidate's second contact number which is asked by IIMs while completing their application form. This was also asked in past also but was not used in the CAT Admit card earlier. Reference Number in CAT 2019 Admit card will replace the earlier Test System Number. The Reference number has limited purpose of saving your time and helping you to identify the floor/wing/testing room at the CAT test Centre on November 24, 2019. However, for any correspondence with CAT Centre, candidate must provide his/her CAT Registration Number. CAT admit card is your passport to appear in the CAT exam. In case you forget to carry the hard copy of CAT Admit Card with your photograph affixed on it to the test centre, you will not be allowed to enter the CAT testing room. Candidates appearing in CAT exam on November 24, 2019 need to download the Admit Card from CAT Website. After CAT Admit card download, you should take a print of the downloaded CAT hall ticket on A4 paper size. You will also need to affix your photograph on the Print out of CAT Admit Card. The CAT 2019 Admit card download facility will be available till CAT exam day on November 24, 2019. You are at the Admit card link. Click on it and it will open the page with Assessment. After your CAT Admit Card is downloaded error free, save the document in the folder that you can remember – for example a document can be created with the name ‘CAT 2019 Admit Card’. Verify all your personal details, your printed photograph, signature image, Date of Birth, CAT registration Number, TSN number as it will be required to locate your testing room and seat in the testing lab, test venue, exam date and time as well as the reporting time at the CAT Exam centre. Take at least 2 prints of the CAT admit card on A4 size paper as you will need the hard copy of the admit card with your photo additionally affixed on it at the CAT exam centre on November 24, 2019. Remember to carry your CAT Admit card to the CAT Exam centre with at least one original photo ID proof as mentioned in CAT Admit Card 2019. Test System Number: You will be assigned your seat with the help of this number. It is very important as you are authorized to use only the particular test system. This system will display all your details. PWD status – In case the candidate is physically challenged, it must be mentioned in the CAT Admit Card else the benefit of reservation will not be there. Admit Card is valid only if the candidate's photograph and signature images are legibly printed. In addition to the Admit Card, at least one original (not photocopied or scanned) valid (not expired) photo identification card (such as College ID, Employer ID, Driving License, Passport, PAN Card, Voter ID, Aadhar Card, Identification Affidavit) should also be presented. Candidates should report at 7:30 a.m. for the forenoon session and at 1:00 p.m. for the afternoon session. Mobile phones or any other electronic gadgets such as watches, calculators and stationary items like pen, pencil, and paper are NOT ALLOWED inside the test centre. Only Admit Card & Photo ID Card will be allowed inside the test hall. Rough sheet(s) and pen will be provided to the candidate for rough work, which will have to be returned after the test. The Test System Number is provided only for the limited purpose of identifying the floor / wing and the computer at the test venue on the day of the test.For any correspondence with CAT Center you must provide your Registration Number. 1. When to Download CAT Admit Card? CAT Admit Card 2019 download will start at 1PM on October 24. You should download it from CAT website immediately after it is released as after a few minutes there will be a great rush and you may not be able to get access to the website. Besides, it will help you to check all your details. There could be one of the three reasons for not receiving the CAT 2019 Admit Card - Due to incomplete or erroneous registrations done earlier; Registration was done multiple times or the Payment of CAT 2019 Registration fee has remained unsuccessful. You should first check that you had received the message of successful submission of your CAT application form. Please note that CAT Centre 2019 may not issue the CAT admit card for the registrations which are not valid or faulty or if the candidate has registered multiple times. 3. CAT fee deducted twice, how to get it back? 4. How to confirm that I will get my CAT 2019 Admit Card? You should check your mail from IIMs that your CAT 2019 application form has successfully been submitted. If yes and still you don’t receive the CAT Admit Card you should immediately contact the CAT 2019 help desk. 5. What is the Test System Number on CAT Admit Card? Your Test Centre will assign you the seat and the computer system based on the TSN number. It is very important as you will come to know about your assigned seat and testing room based on your test system number. 6. Can I download CAT 2019 Admit card from my Mobile Phone? It is recommended that you should view the CAT Admit Card only using the recommended browsers and not from your mobile phone. You should use one of the three correct versions of the recommended Internet browsers-Internet Explorer – version 11 and above; Mozilla Firefox – 50 to 61; Google Chrome 50 to 69. If the Admit Card is blank, you need not worry. If the candidate registers multiple times, CAT Centre 2019 will consider only the most recent (last) registration as the official application for CAT 2019. Admit Card generated for you is for the most recent (last) registration. Thus, if you login by using User ID of earlier registration attempts, you may find your CAT Admit Card as blank. 8. Will IIMs send the hard copy of CAT Admit Card? No, you need to download the CAT 2019 Admit Card from CAT exam website by using your CAT 2019 ID and Password. 9. My CAT Admit Card has errors, how to rectify them? In case CAT Admit Card contains errors, it could be due to the wrong filling up of application form as the information on CAT admit card is taken from your application form. However, you should contact the CAT 2019 help desk on phone1800 209 0830 (Toll Free) or e-mail ([email protected]). You should have your User ID and/or Payment Transaction Number details at hand for reference. After a few minutes from the CAT Admit card release, thousands of the candidates try to get access to CAT website simultaneously due to which some technical glitches may come up. The best strategy at that time is to access the website after some time when the rush gets subsided. Since 2014, CAT Admit card could not be issued on announced scheduled date and the issue date is delayed by a few days. However, CAT 2018 admit card was issued in time on pre announced date. The CAT 2019 Admit card may not be delayed by the IIMs. The CAT Admit Card is a mandatory document required to take the exam. IIMs clearly advise that you must print the Admit Card and bring it to the exam centre on the day of the exam along with your photograph identical to the image used in the CAT 2019 registration and application form. The candidate will be eligible for an Admit Card only upon submission of online application form. The candidate should have received an automated email confirmation upon successful submission. The admit card will be only available on the CAT Website when you log on using your CAT 2019 User ID. No hard copy of CAT 2019 Admit card will be sent to you.